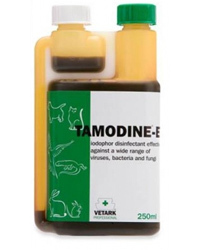 Tamodine E is an iodophore disinfectant, it is suitable for general purpose vivarium disinfection. Also for use in veterinary surgeries, hospitals, schools, catering establishments, shops, and other public and industrial premises as a general purpose disinfectant. It has the benefit of having a built-in colour-marker, which means the user can see where they have treated, and also when they have washed it off. In a made up solution for dips, washes, footbaths etc it loses its colour when it becomes inactive. Walls, floors and other surfaces: Wash with a solution of 45ml in 10 litres of water. Use 90ml in 10 litres of water for porous or heavily soiled surfaces. Dishes, utensils, snake hooks etc: Wash in a solution of 30-45ml in 10 litres of warm water. For sanitising rinse only, immerse for at least two minutes in a solution of 15ml in 10 litres of water. Hand dips: For personnel handling food,etc use 15-30ml in 10 litres of water. In animal accommodation or on dishes wipe off, or rinse off the Tamodine-E after cleaning before use.